Clearing guide for parents - Which? Ucas Clearing is a useful option for those students who want to go to university but didn’t receive the grades they needed to get into their first or insurance university choices. It’s also an opportunity to look for courses, for those who didn’t get accepted by any unis in their initial application. 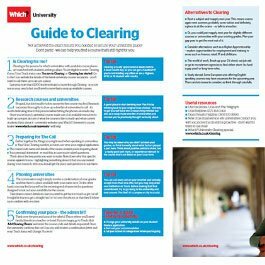 Clearing allows students to view all the remaining courses that have places available in September at universities across the UK. In 2017, nearly 60,000 students found a place at university through Clearing. If your child is nervous about their results, it’s a good idea to think about their Plan B in advance of Results Day, and to discuss Clearing with them as an option. They may want to read about student Megan’s journey through Clearing. If they do have to go through Clearing, they will need both of these. Ensure they re-read their personal statement. If they have to make a Clearing phonecall to a university then having their personal statement fresh in their mind should really help. If they're nervous about speaking on the phone, perhaps practise a mock phone call with them to put their nerves at ease. Get advice on how to make a Clearing call to universities. Before your child enters the Clearing process, if they have narrowly missed the grades they needed, remind them it’s always worth phoning their firm and insurance university choices to see if they’re still willing to offer them a place. Students can go to the Ucas website's Clearing section to see what courses are available. Once they’ve picked some courses they like the sound of, it’s time to do some quick research with our course search to see if the course meets their needs. It’s important that they don't panic, rush their decision and pick the wrong course for them. Clearing is open until the 23 October, although some course places will be snapped up quickly. They will then need to call the university to see if they can get a place on the course they’ve chosen. This may be a short phone call to confirm their grades and accept the place, or a longer conversation with a mini interview over the phone with some challenging questions. It’s worth asking them to read how to make a Clearing call to universities. Once they have decided whether they want to accept a course, they will need to update this online through ucas. They will also need to make sure they let the Student Loans Company know about the changes to their university choices. For more detailed help and advice to support your child, go to our dedicated Clearing and results day area or download our handy guide below.